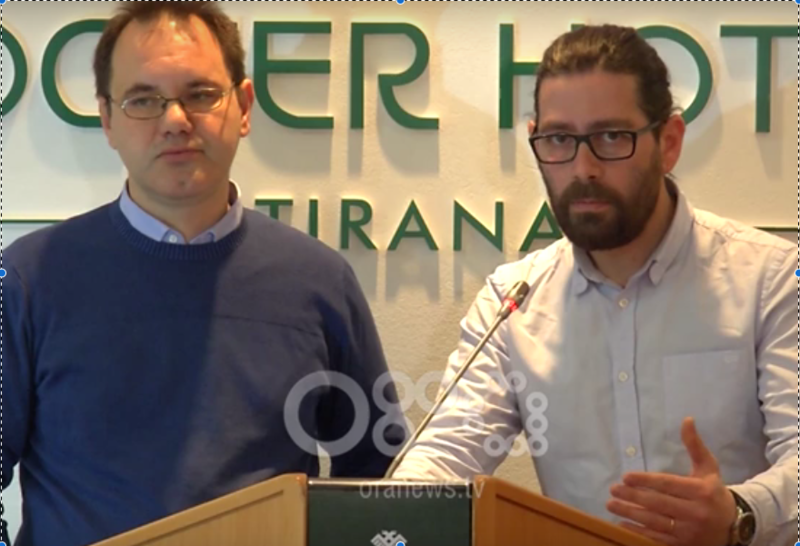 BIRN representative Gjergj Erebara and AMC representative Koloreto Cukali, during the press conference presenting the declaration against the 2 draft-laws that threaten the freedom of the online media. A group of organizations for the protection of human rights, freedom of information and journalists associations demand from the Prime Minister to drop proposals on regulation of online media. We inform the public that the two proposals endangers freedom of expression and could turn Albania in a undemocratic country and in the same time, are not helpful in tackling existing problems of the media, including hate speech, defamation, propaganda or disinformation. The two draft-lawsi aim to create a registry of online publications and provide rights to an institution known as the “Complaints Council” to sanction online media based on third party requests, to order their closure or block of the access on such media in the territory of the Republic of Albania. The draft-laws provide legal mechanisms for Audiovisual Media Authority (AMA) and Tax Authority to fine or close down online media without clear procedures. As such they pose a threat to seriously increase the level of censorship and self-censorship already present in Albania’s media scene. We observe that the argument provided repeatedly by AMA and other officials, including Prime Minister Edi Rama, that the proposals are based on “Croatian model” is inaccurate. We have investigated such claims and found that no such laws exist in the Republic of Croatia. If the ruling socialist parliamentary majority will enact these proposals, our hybrid democracy will inevitably slither toward an authoritarian regime. In democratic countries, the aim of the law is to protect citizens from the government and not to protect government from the citizens. While acknowledging the numerous problems that currently plague online communications, including unnecessary offensive language, libel and hate speech, we believe that the current proposals fail to tackle such issues while in the same time, they have the potential to be used as pressure tools by the government against journalists and critics. Self-regulation of the media, education and public awareness campaigns aiming to improve media literacy; awareness of propaganda, disinformation and fake news are the adequate tools to counter these problems – both online and offline. Being aware that Albania has to align its legislation with that of the European Union, we observe that the two proposals risk setting back the process of European integration of the country. The proposed legislation, in its current form, can only lead to increased control of the government over the majority of media outlets in Macedonia. Furthermore, the decision to entrust regulation of both print and online media to the powerful new Agency for Audio and Audiovisual Media, reveals a desire to extend control over those media sectors.